There is no State of Michigan Historical Marker at this site. Perhaps there should be. Viola Liuzzo was a Detroit housewife and civil rights activist. On Bloody Sunday—March 7, 1965—Dr. Martin Luther King was in Alabama advocating that blacks be allowed to vote in that state. Dr. King attempted to lead a group of about 600 on a march from Selma, Alabama to the state capitol in Montgomery. Before they departed from Selma, the marchers attempted to cross the Edmond Pettis Bridge. As they did so they were brutally attacked by Alabama police officers and by very many supporters of the Ku Klux Klan. While there were no deaths, the violence was substantial. At this time, national television coverage of local events was in its infancy, but that evening, the national television networks prominently featured the bloody attacks upon those who were seeking the right to vote in Alabama—a right that Americans in the North took for granted. During the week following that violence, Dr. Martin Luther King called for civil rights supporters from across the nation to come to Alabama to show their support for the Fifteenth Amendment. Viola Liuzzo grew up in a coal mining area of Pennsylvania but both of her parents were unemployed during the Depression. The family moved to Chattanooga in hopes of finding better economic prospects but continued to suffer from poverty. There, Viola Liuzzo came to realize that even though her family was impoverished, they were treated with more respect than blacks. Eventually, she moved to Detroit and took a number of different jobs, including one as a cashier in a market. There she met and became a close friend of Sarah Evans—a black woman who was active in the Detroit chapter of the National Association for the Advancement of Colored People. Viola Liuzzo had a great understanding of the problems Detroit blacks faced so she also became active in the NAACP. Thus it was not surprising that when Dr. King called for volunteers to assist in the Alabama voting rights marches, Viola Liuzzo drove to Alabama. Once in Selma, Ms. Liuzzo performed volunteer activities such as shuttling people to meetings and assisting those planning the march to Montgomery. On March 9, Dr. King decided to lead another march from Selma to Montgomery but, after starting, turned around since he knew the dangers. That evening one of the whites who had come to Selma, Reverend James Reeb—a Unitarian minister from Massachusetts—was beaten in Selma and died of his injuries. Realizing that the violence in Selma appeared to abrogate the Constitutional rights of civil rights advocates in Alabama, and aware that a growing number of people from around the country were going to Selma to join the protests, the federal government strongly pressured Alabama authorities to provide some protections for those who wanted to march. Those negotiations made it safe for Dr. King to lead a march on Sunday, March 21, 1965, one that turned out to be much more peaceful than the previous marches. On the evening of March 21, Viola Luizzo volunteered to use her car to bring back to Selma some of those who had marched to or in the direction of Montgomery. She was driving with a young man, Leroy Moton, on Alabama highway #80 that linked Montgomery and Selma. A car pulled alongside Ms. Liuzzo’s car. Shots were fired and Viola Liuzzo was murdered. Ms. Liuzzo’s funeral took place on March 30, 1963 at the Immaculate Heart of Mary at 16000 Pembrook in Detroit. Among those who attended her funeral were James Farmer, head of the Committee on Racial Equality, Jimmy Hoffa, president of the Teamsters Union, Dr. Martin Luther King, William Milliken who was about to become governor of Michigan, Walter Reuther, head of the United Auto Workers and Roy Wilkins, head of the NAACP. The day after Viola Liuzzo was murdered; President Johnson appeared on national television to announce that the FBI had arrested the four members of the Ku Klux Klan who were in the car when the fatal shots were fired: William Eaton, Gary Thomas Rowe, Eugene Thomas and Collie LeRoy Wilkens. These men were tried for murder twice in an Alabama court but were acquitted of the murder charges. They subsequently faced federal civil rights charges. It then came out that Gary Thomas Rowe was an FBI informant. At this time, the federal investigation agencies had infiltrated many hate groups. Mr. Rowe had been receiving funds from the FBI for five years. He agreed to testify against the other defendants in return for a promise of immunity. This proved to be a very embarrassing circumstance for Mr. J. Edgar Hoover, director of the FBI and, to a lesser degree, for President Johnson. Apparently Mr. Rowe had warned the FBI that the Klan would carry out some violence during or after the March 21 civil rights march from Selma to Montgomery. It is unclear exactly what FBI officials knew but they had been informed that violence was probable and they did not take any steps that might have prevented the murder of Viola Liuzzo. Realizing that the reputation of the FBI might be compromised, Mr. Hoover apparently encouraged his public relations officials to carry out a campaign to tarnish the reputation of Ms. Liuzzo. Hoover was widely believed to have very little sympathy for the civil rights movement and took action to protect civil rights activities only when specially directed to do so by President Johnson or White House officials. Apparently, Hoover strongly believed that the American civil rights movement was being orchestrated by Communists who wished to destabilize and then destroy the United States. Hoover’s staff sought to portray Viola Liuzzo as a derelict mother—she had five children in Detroit but left them to go to Alabama. Apparently, Director Hoover also encouraged his aides to suggest that Ms. Liuzzo was addicted to drugs and was intimately involved with young black men in Selma, including, Mr. Moton who was in the car with her when she died. He was not injured. These charges were made despite the autopsy that found no drugs in her system and that she had not been sexually active in the period before she was murdered. There were also suggestions coming from the FBI that her husband was involved with organized crime in Detroit. In the federal trial involving charges of violation of an 1871 law that made it a federal crime to conspire to violate civil rights, defendants Eaton, Thomas and Wilkins testified that FBI informant Rowe actually did the shooting. He, of course, had immunity. However, the three others were convicted of conspiracy. Mr. Eaton died before sentencing but Thomas and Wilkens were convicted and sentenced to a decade in federal prison. The Liuzzo family, in 1978, sued the FBI and the federal government charging that they were aware that a crime was likely to occur and that federal authorities failed in their duty to protect the civil rights of a citizen. It was a well-publicized trial but the federal government prevailed in this litigation. The FBI was exonerated in this civil suit and, furthermore, obtained a judgement against the Liuzzo family for $79,000 for legal fees but they settled for a much lower fee. The film Home of the Brave, directed by Paola di Florio, describes the life and death of Viola Liuzzo. It was a prize winner at the 2004 Sundance Film Festival. The most famous of several books about these events is the first one listed below. The murder of two whites—Reverend Reeb and Viola Liuzzo—who had gone to Alabama to show their support for voting rights played a role in getting Congress to enact the Voting Rights Act of 1965. There is an impressive memorial to those who lost their lives in the Civil Rights Movement in Montgomery. This was designed by the famous sculpturer, Maya Lin, who designed the Vietnam memorial on the Mall in Washington. Viola Liuzzo is one of forty names inscribed on that impressive memorial in Montgomery. The only memorial to Viola Liuzzo in her home town of Detroit is this humble and not so well-maintained small playground. 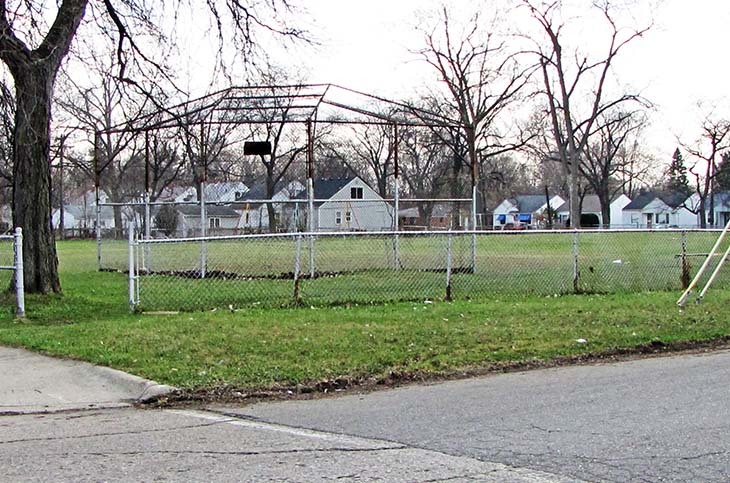 In spring 2015, the Greening of Detroit organization announced that they would try to raise funds to renovate this playground. In July, 2015, Mayor Duggan of Detroit announced that twelve million dollars in bond funds would be available to update and modernize 40 parks in the city. One million will be devoted to Viola Luizzo playground in northwest Detroit. This involves the addition of a bioretention facility, a playground, a pickleball court, fitness equipment and a walking tract. I will try to add a picture of the remodeled park in the spring or summer of 2017. Books: Mary Stanton, From Selma to Sorry: The Life and Death of Viola Liuzzo. Athens, Ga.; University of Georgia Press, 1998; Gary Max, The Informant: The FBI; The Ku Klux Klan and the Murder of Viola Liuzzo. Devon: Pennsylvania, Duke and Company, 2005.